When it comes to certified RV windshield replacement we have the best prices and the fastest service with a smile. Our expert windshield installation crews are very experienced and have all the right tools to get the job done accurately. We go the extra mile to make sure everything is done right the first time. RV windshields can get nicks, chips, and cracks from debris off the road and falling from trees at parks and campsites. We have even seen instances where objects have fallen and scratched the glass. Don’t worry – we handle anything you throw at us. Even rear glass, windows, and electric power window motors and regulators can be taken care of with no problem. 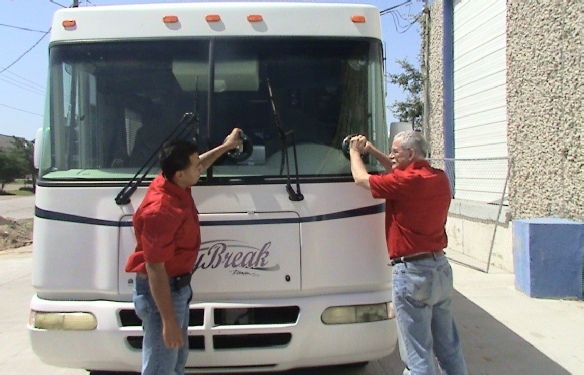 We look forward to having our certified RV windshield repair crew helping you the next time it is needed.